Yellowstone Part IV: Plan Your Trip! 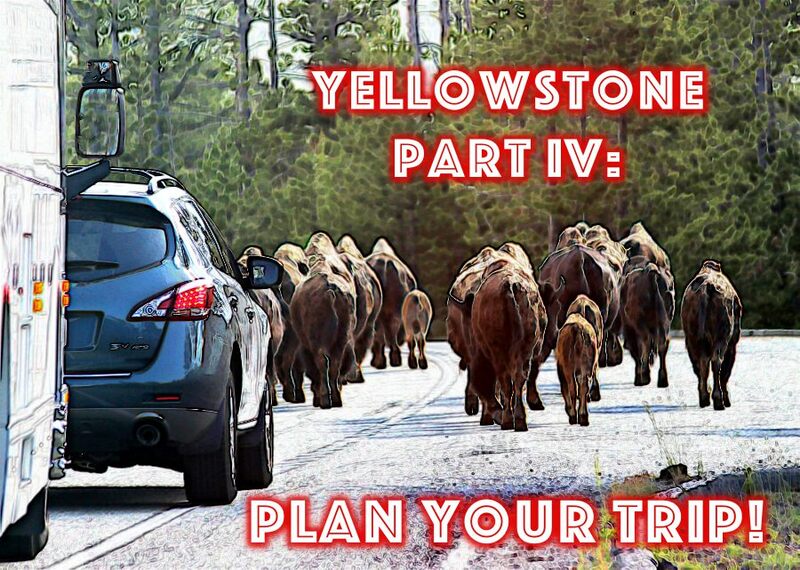 Are you planning a trip to Yellowstone? If so, this post is for you. Of course, you could simply drive across the country and show up at Yellowstone and wing it, but nah….you don’t want to do that. Trust me. With many national parks, you can spend a day or two and see it all. This is definitely not the case with Yellowstone. It is the 2nd largest park in the contiguous US at 3500 square miles (coming in behind Death Valley). Plan to log a lot of miles and a lot of hours traversing the park. Driving is often slow going. This is due to both the traffic and the wildlife. When we visited in early June, the park was packed with tourists. Parking lots were full at many attractions, requiring us to drive around and around to get a spot. The whole park needs a sign that says “Bison Crossing.” You will see lots and lots of bison as you criss cross the park. 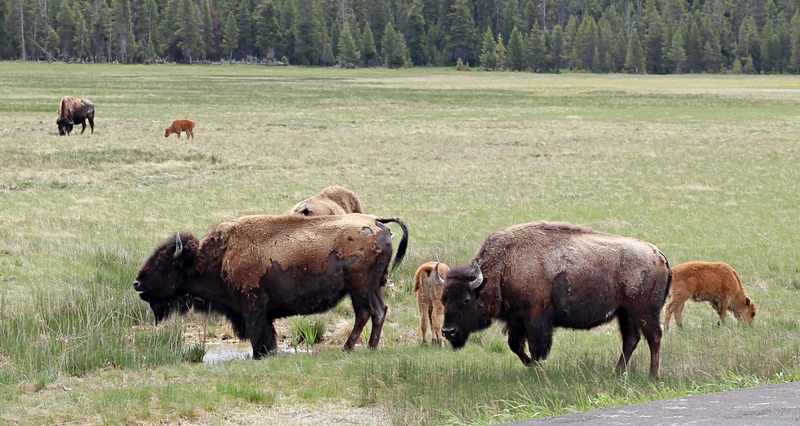 Yellowstone has the largest herd on public land in the US, with almost 5000 bison in the park. This is great…unless they are in the road. In addition to the wildlife being on the road, they also slow traffic by providing roadside photo ops (like the bear we saw on the North Loop) and by causing reduced speed limits within the park. 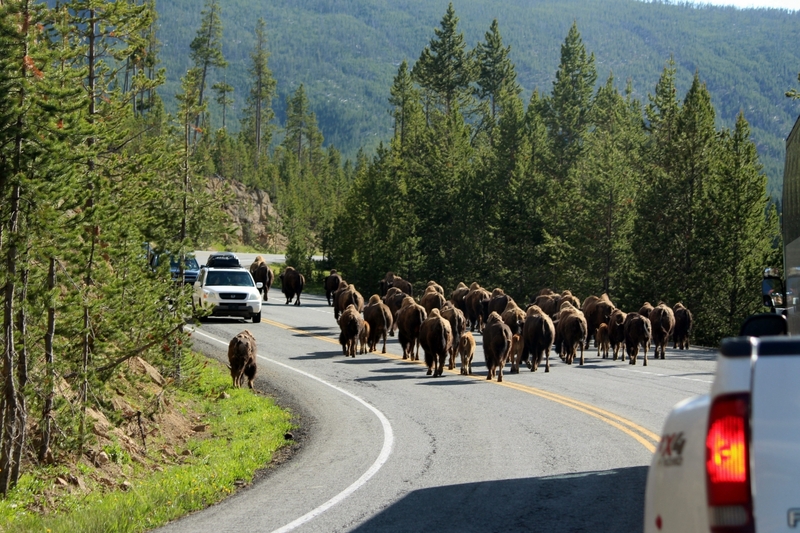 Visitors are urged to drive slowly, just in case you suddenly come upon some elk, moose, deer, or bison in the road. The tow truck driver we met in the Grand Tetons verified that collisions happen, and they aren’t pretty. Minimally, I would plan on three days to explore the park, if you are content to just hit the major highlights. If you want to see more sights, go hiking, or have more experiences in the park and surrounding area, you will need four days or more. Some people spend weeks exploring Yellowstone (and some spend their lifetimes returning again and again). I don’t think you would ever run out of things to see or do, so you don’t need to worry about planning too much time. If you are planning to stay in an RV park or campground, you really need to think a lot about location. Should you stay in the park or outside? Should you stay in one location or more? We would have been fine staying in Fishing Bridge because, really, how much time do you spend in the campground when you are at a place like Yellowstone? 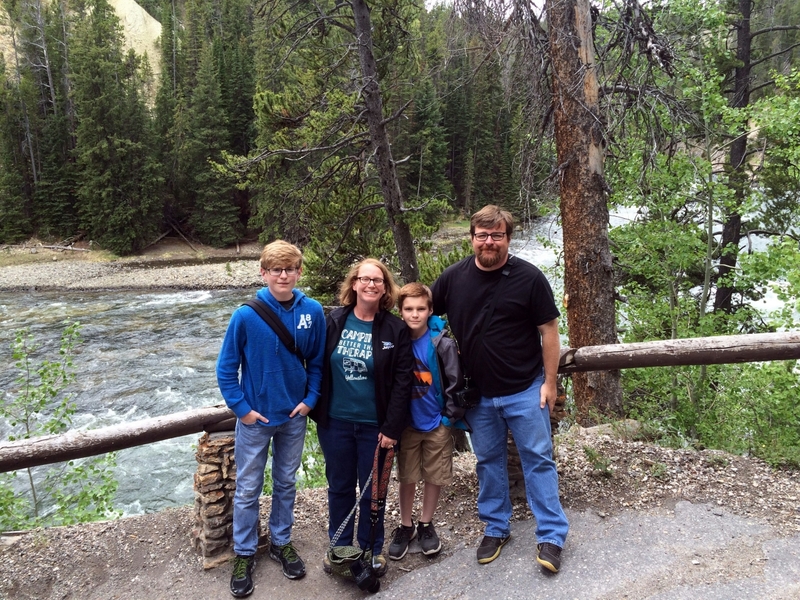 However, our family has figured out that we do better when we have amenities like wifi, restaurants, and grocery stores nearby, so we opted to stay outside of the park (a post is coming soon about our stay at Grizzly RV in West Yellowstone). Staying outside of the park: If you opt to stay outside of the park for all or part of your stay, you have to decide which small town to use as a basecamp. As large as Yellowstone is, it has five entrance gates located in three states. You’ll find small towns full of commercial services outside most of these gates. Here is a great resource about Yellowstone’s Gateway Towns. Be aware that some are closer to the park’s main sights than others. We drove into the park from Cody, WY, and we would not want to drive that far every day. We opted to stay in West Yellowstone at Yellowstone Grizzly RV Park because it was in a great location and had plenty of amenities (and charm). 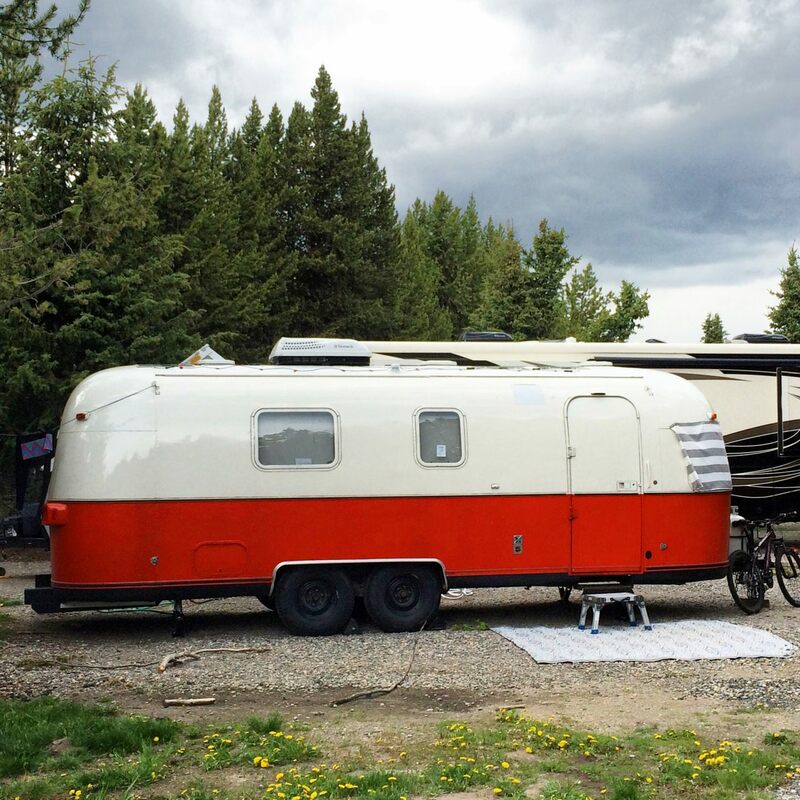 Splitting your stay between two basecamps: Staying inside the park for a few nights and outside the park for a few nights is a great plan if you are spending several days in Yellowstone. This gives you the best of both worlds. In Yellowstone’s early days, the Grand Loop Road was devised as a way to connect many of the park’s major features. This 140-mile route is shaped like a figure 8 (see the park map here). Old-time travelers would make the journey with horses and carriages, staying in the park at camps or lodges. The Grand Loop still provides structure for those touring the park to this day. We decided to spend one day touring the North Loop and another touring the South Loop, knowing it wasn’t likely we would make it through either in a single day. We reserved our remaining days for anything we didn’t hit on our first days. This plan worked well. The only downfall was our location in West Yellowstone put us quite far from the northeast corner of the park, so we never made it there. Moon Handbook’s Yellowstone & Grand Teton: We’ve discovered that we really like Moon Handbooks. They seem to be quite thorough and informative about sights, and they often have good notes to help us understand the history and geology of each place. When approaching Yellowstone, this guide profiled the major areas and helped us develop a good list of must-sees. Yellowstone Expedition Guide: The Modern Way to Tour the World’s Oldest National Park: My in-laws gave us this book, which has nice color photos and a set of CDs. We listened to the audio tour as we spent many hours driving around the park. 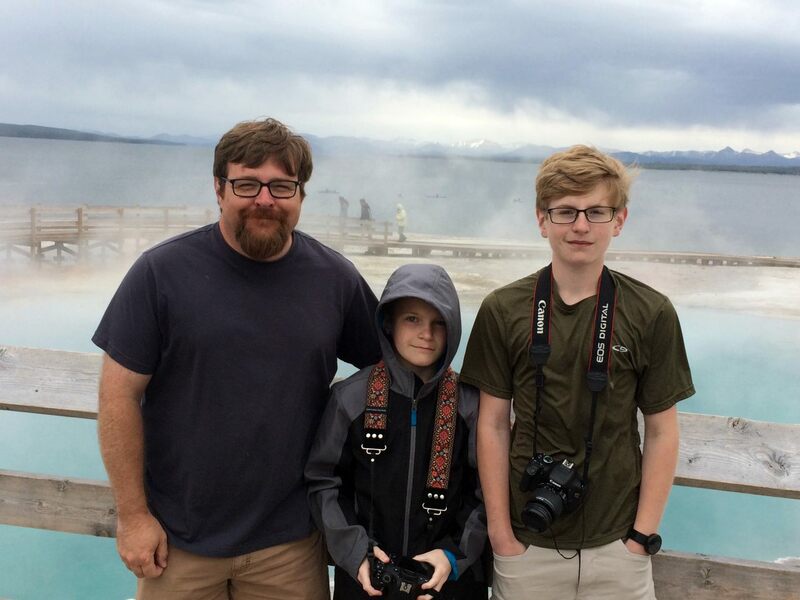 Beware: One whole section details several deaths that occurred in Yellowstone. Our boys thought this was gruesome (but they found it hilarious that their parents were listening to these horrific stories). Besides learning what not to do in Yellowstone, we found the audio tour a perfect way to gain context about the sights we were seeing. Of course, CDs might be a little old-fashioned these days, so I highly recommend finding a Yellowstone tour app or something similar. It’s like having a portable park ranger and truly enriches your experiences. As the audio tour taught us, Yellowstone can be a dangerous–even deadly–place. This is primarily due to the geothermal features and the wildlife. On our trip to Yosemite last summer, my kids began doing a screechy impersonation of me saying, “This ain’t Disneyland; y’all are gonna die!” While I never this exact words, I did remind my children many, many times that our national parks are quite different from theme parks. In our society, we are used to almost everything being sanitized for our protection, but national parks are still wild and free in many respects. You must respect these natural elements. Respect the wildlife. 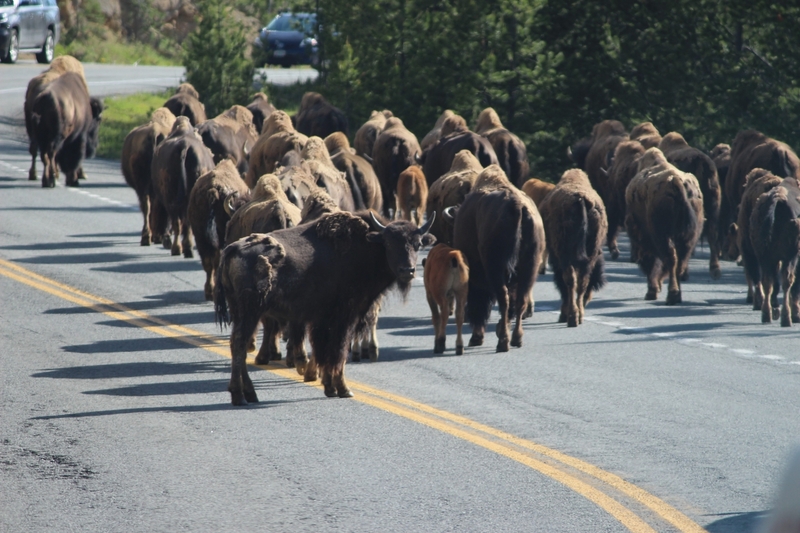 Yellowstone is chock full of wild creatures, and they aren’t contained behind the kinds of barriers you’d find at a zoo. Unfortunately, despite the many warnings about staying a good distance from wild animals, several people are harmed each year in Yellowstone. On our first drive through the park, we saw a man taking a selfie about 10 feet from a bison. I yelled, “Idiot! !” out the window. Probably wasn’t the nicest thing to do, but I couldn’t help myself. Bison, elk, and moose are all known to suddenly–and swiftly–charge. Do not approach wildlife, and for pete’s sake, do not try to take selfies with them. You can, however, stick your camera out your car window to snap a shot as you roll by. Though bison are the most visible animals in Yellowstone, you must also be bear aware. Bear spray is a must if you are hiking, and you must follow precautions while camping to avoid attracting bears to your campsite. Furthermore, be aware that trails may be shut down due to bison and bear activity. Respect these closures for your safety. Use precaution in the thermal areas. 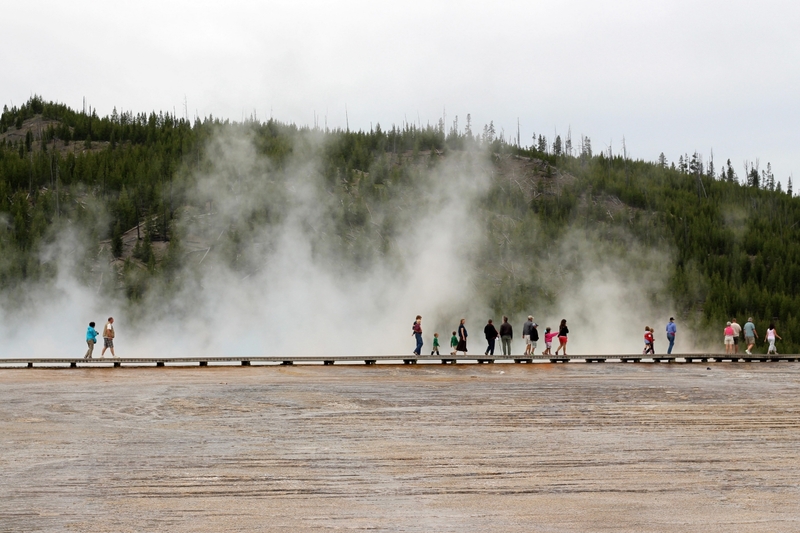 Yellowstone allows you to walk over or right up to many of the geothermal features in the area, which range from fragile landscapes to boiling hot springs. We saw people trample right into the landscape around Old Faithful, with no regard for the natural elements or their own safety. Some boardwalks are open, with no railings. You can fall off the boardwalks and injure yourself or damage the natural areas. We were shocked to see kids racing along these boardwalks, and we worried about their safety (I almost broke out my teacher voice to reprimand the children–or their parents). 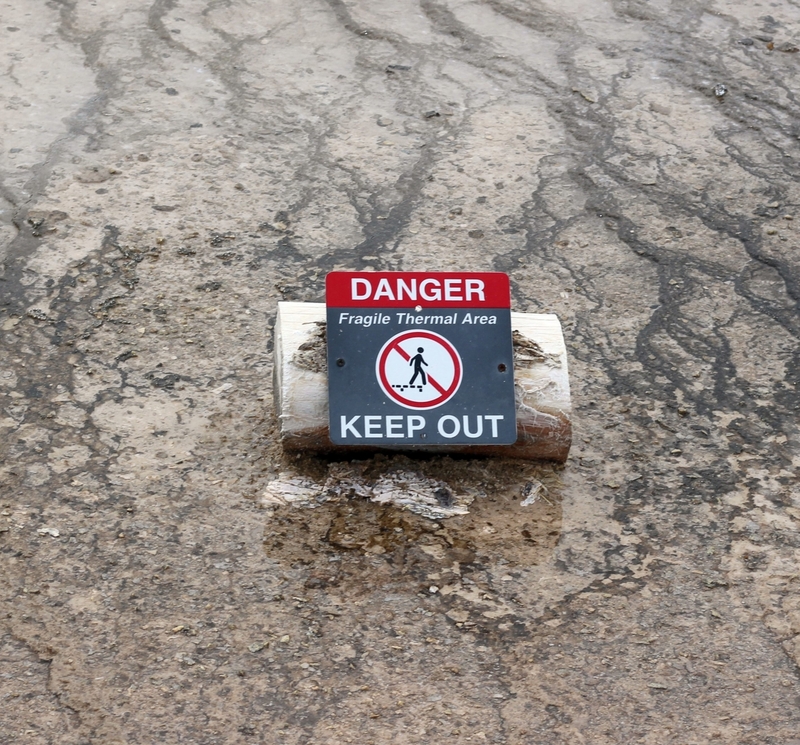 Most people who are killed by geothermal features have ventured out into restricted areas. Right before our visit, a young man died in a hot spring. He and his sister had purposely left the boardwalk. Respect the warning signs, pay attention, and be careful…this ain’t Disneyland. Pack a lunch, and take snacks. By the time you get into the park and see a couple of sites, you are likely to be hungry and may not be near any restaurants or stores. We chose to take our lunch so we could eat wherever and whenever we wanted. Enjoy some huckleberry ice cream. I had never heard of this treat before our trip to Yellowstone, but it’s amazing. Saving money by packing our lunches allowed us to spend more freely on snacks when we needed an energy boost. If camping, be aware of the potential for freezing temps. Night temps can be very cold–even below freezing during the early summer months. Make sure to have a way to heat your trailer and to care for your water pipes, if needed. 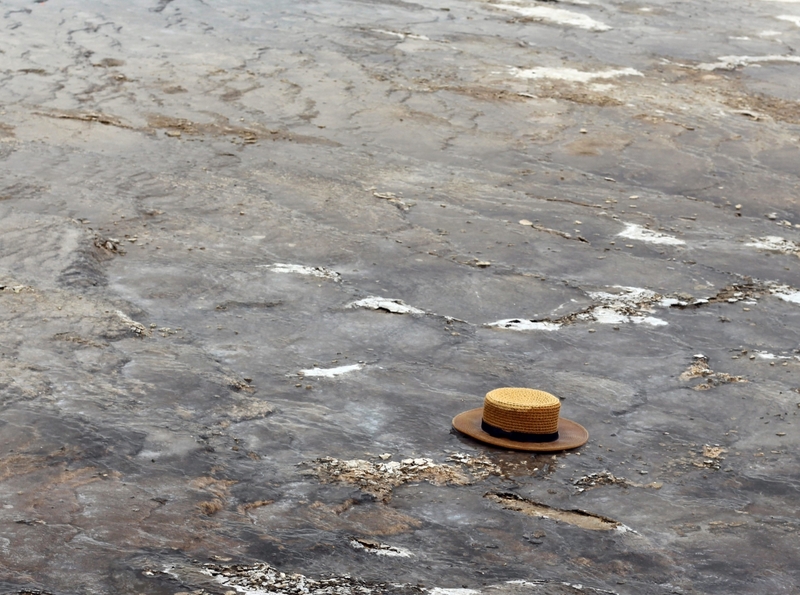 Hang on to your hat—literally! Don’t wear hats that can blow away. We saw 20 or so that had blown into restricted areas. I imagined that some poor park ranger has to drive around each evening using a grabber stick to retrieve these (I have no idea if this actually happens). Don’t plan too much. After spending three full days adventuring in the park, we were exhausted. We really should have planned for a down day in the middle. We ended up using our final day to do laundry and watch a movie in West Yellowstone instead of going back to the park. This may have been due to the fact that we were nearing the end of the second week of our Birdy NPS 100 trip, so we had already spent many, many days packing in adventures. Take lots of pictures. 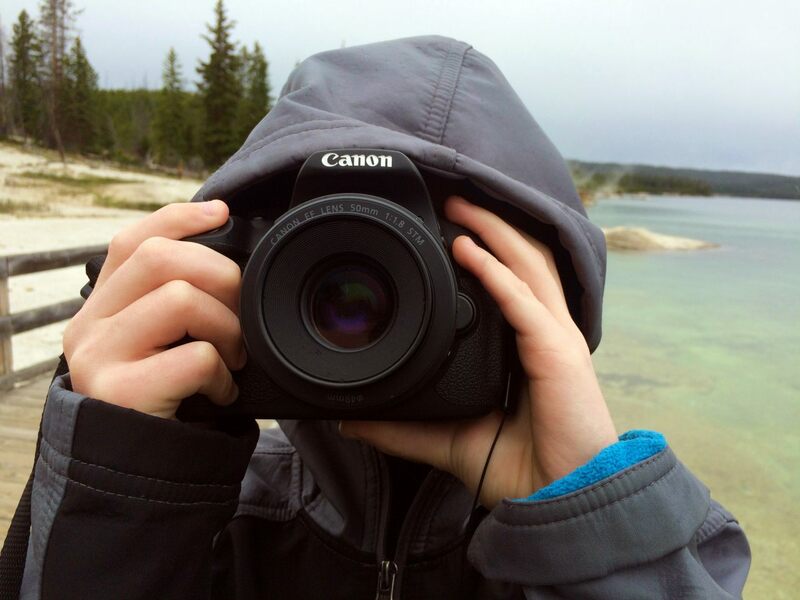 There’s always something to snap a picture of in Yellowstone, even if it’s your own kid snapping a picture of you. 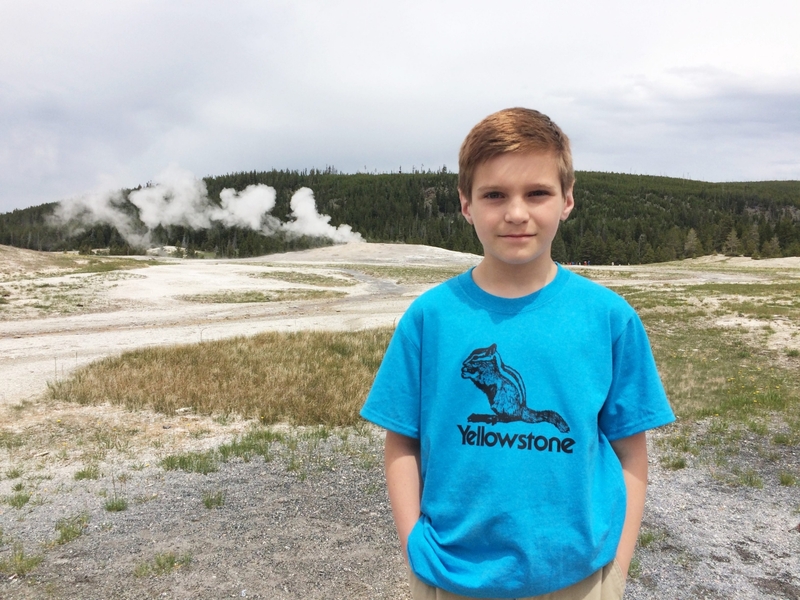 Yellowstone was eccentric, exciting, educational, exhilarating, epic, entertaining, and exhausting! I’m so glad we took our kids here, and I think they were at great ages to truly appreciate the park. My younger son (the one who doesn’t like to travel) was even impressed! I have no doubt both boys will always remember this trip. If you are planning a trip to Yellowstone, I hope these tips help you make the best of your trip. I think everyone who can should take a trip to Yellowstone at least once in their lives. There’s nothing like it anywhere else in the US. You’ll get to experience this national treasure while making great family memories. Posted in: Places We've Explored. Tags: BirdyNPS100, National parks, Tips, Wyoming.